Tufts fits me and my veterinary aspirations perfectly. At Tufts, I am able to explore the clinical skills that save animals’ lives while also developing my background in public health theory – establishing habits and relationships that will enable me to adapt to the evolving veterinary field. I was drawn to Tufts because of its dedication to providing students with the backgrounds they need to work in a variety of veterinary capacities. The many dual degree programs offered, including the Masters in Public Health, which I am currently pursuing, and the renowned faculty immediately impressed me. What made my decision, however, was how welcome I felt on campus. Touring the school, everyone I encountered seemed much happier than any other visits I had made. The students I met had diverse interests just like mine and were enjoying their studies, though working very hard. At the conclusion of my interview day, I knew I could thrive at Tufts. The opportunity to pursue a dual degree: the dual degree programs are far better developed than any other schools, at least at the time when I applied. Most other programs require significant online course work and many extra semesters of work. Though it is still challenging to juggle anything in addition to a veterinary degree, Tufts really helps make the program more manageable and applicable to vet medicine. Access to research: I have had many opportunities to become involved in research projects while at school. The summer before my first year, I helped with an equine treadmill study and an orthopedic clinical trial using a rabbit model. My exposure to research and opportunities to get involved has only expanded since then. Doctors are very accessible and always willing to work you into a project if you are interested in the topic. Ability to pursue your own research project: I am currently working on a project studying stress in horses used in therapeutic capacities. I was only able to develop this project because of the interest and patience of my project advisors, the in-house funding opportunities that Tufts makes available to its students, and the powerful reputation of the school, which made horse owners take me seriously. Loads of clinical experience: As a coordinator of the Large Animal Student tech team, I have been trained to work as a technician in our Large Animal Hospital’s surgery and medicine services. Though the middle-of-the-night calls can be exhausting, the experience is amazing preparation for my coming clinical years and life as a doctor. I learn the fastest when I am working in the hospital. One of our new interns commented to me the other day that she was jealous of how many opportunities Tufts students have to work in the hospital and how she wishes she had the same at her alma mater. Leadership opportunities: Tufts’ many active student organizations have given me the opportunity to grow as a leader in many ways. 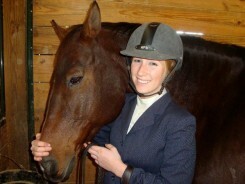 As the president of our student chapter of the American Association of Equine Practitioners, I served as a leader of my peers, liaison with faculty and other practitioners, and really had to perfect my time management skills. One of the best experiences I’ve had was working on the Applied Learning Experience (ALE) for the MPH program last summer. My ALE is a research project under the mentorship of Drs. Nick Frank and Megan Mueller, evaluating stress in horses used in therapeutic activities. 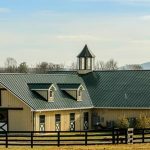 Therapeutic horseback riding is becoming an increasingly popular prescription for patients with a range of conditions. 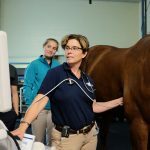 With this increasing demand, I believe it is important to understand how these activities affect the equine therapist, thus we are measuring salivary cortisol in horses as they work with riders in both therapeutic and mainstream riding programs. One of the reasons I pursued this project was my desire to spend the summer around horses and out on the farm rather than inside a lab. 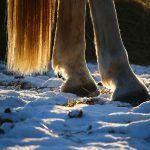 Those factors have been incredibly enjoyable but have also added unanticipated challenges to the work, as we have to balance things like weather and horse and rider compliance. The project has required me to think creatively and quickly solve problems while remaining true to the protocol of the work. Also, being the only vet student on a summer camp with 60 horses, I am the one who is called first any time a horse has anything from a small cut to a cough. I usually end up calling the real vet, but it is exciting to be the first one on the scene to triage the horse; this has given me some incredible real-life experience. Overall it has been a blast, and I am excited to take my samples to the lab to see what we can learn. I am currently engineering a career that combines my love for horses with my passion for public health. The current plan is to do an equine internship, in order to really solidify my clinical skills and understanding of real-life practice, and then beginning exploring community development and public health policy work. 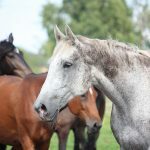 To be honest, my plans change a little bit every couple of weeks, but are always centered on horses and public health. I love that Tufts is giving me the skills I need to work with both. Though I’m very busy, I balance school with my many personal hobbies. I catch-ride horses at local farms whenever I can. Riding is my preferred activity, but I also love distance running and yoga. Grafton is perfect for trail running, especially in the beautiful fall. Besides school and exercising, I also fill my time with the Christian Veterinary Mission. I am an active member in our Tufts chapter and currently packing for a mission trip on an Apache reservation out west.